nly 30 minutes north of Santa Fe, on the High Road to Taos, lies a small Spanish village called Chimayo. 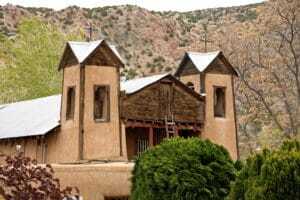 With a population of less than 3,000, Chimayo is well known for several reasons. Perhaps the villages most common claim-to-fame is the Santuario de Chimayo (http://www.elsantuariodechimayo.org). The quaint adobe structure was built in the mid 1800’s on what is believed to be sacred ground. There are many miraculous stories associated with the specific location. Each year during Holy Week, thousands of people make a pilgrimage to the Santuario. Many believe the small pit of Holy Dirt holds healing and restorative powers. As a visitor, you can bring a container to take some home with you. As you walk through the church, pass the altar, you’ll notice a small room filled with devotional artwork and the walking sticks and crutches of those who claim to have been healed. 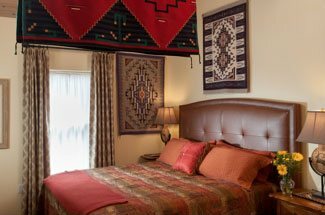 Chimayo is revered for it’s high quality weavings and traditional Hispanic and Tewa Indian artwork. Be sure to visit Ortega’s Weaving Shop (http://www.ortegasweaving.com) and Centinela Traditional Arts (http://www.chimayoweavers.com) for the finest examples of local crafts. In addition to weavings, you will find intricate tin work, retablos (paintings of saints on flat wooden slabs), bultos (large wooden sculptures), and pottery. There are also a few small museums in Chimayo, which expound upon the history of the area. The Chimayo Museum is located in the ancestral home of the Ortega family. The collection includes furniture, clothing, and tools from the past, highlighting the area’s rich history of farming and craftwork. The newly opened Bernardo Abeyta Museum offers a thorough account of the man who founded the Santaurio de Chimayo and of the villagers in that era. If you find yourself craving some traditional Northern New Mexican cuisine, be sure to stop into the famous Rancho de Chimayo (http://www.ranchodechimayo.com). Utilizing the spiciness of red and green chile, the restaurant offers up the best of the area’s native cooking. 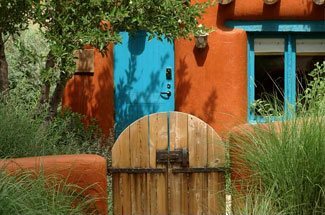 While Chimayo may only be the first stop of many on your way to Taos, it is arguably one the most memorable. Be sure you make the time to take in this historic villages charm.